Our warmest thanks to all our partners in celebrating this year’s Water Awareness Month. It was a wonderful month celebration and we were so moved to see all our partners and their communities come together to celebrate. So, we are delighted to share a few highlights from Water Awareness Month 2018. The University of Arizona Water Wise program placed a Water Awareness Month display at a mall in Sierra Vista. It had over 300 water conservation posters adorning its walls along with free information on ways to conserve water. 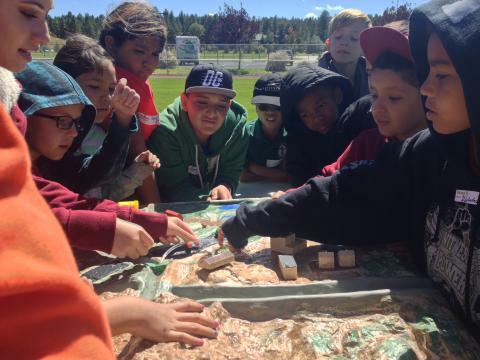 The 7th Annual Apache Junction Water Festival was an opportunity for fourth graders and teachers to celebrate water and help better the environment with four interactive areas. 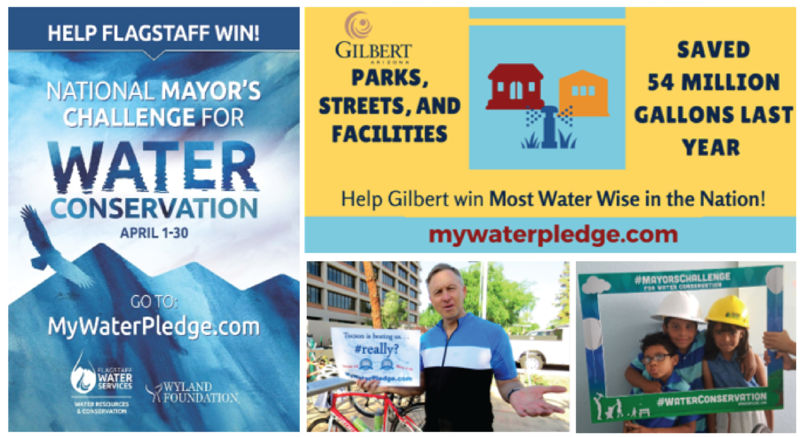 During Water Awareness Month various cities and towns such as Flagstaff, Mesa, Gilbert, and Tucson joined the Wyland National Mayor’s Water Challenge for Water Conservation. The challenge is a friendly competition between cities across the US to see who can be the most “water-wise” through a series of informative, easy-to-use pledges online. 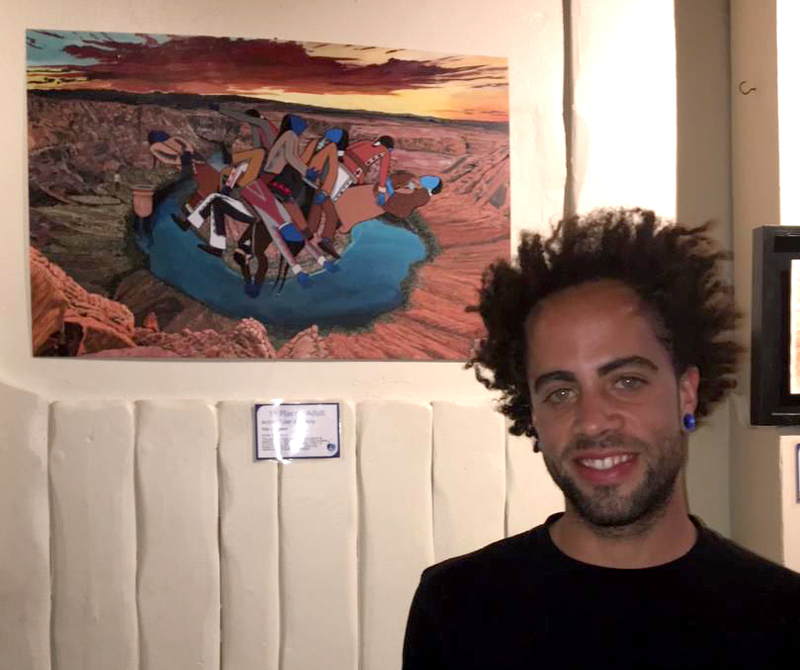 Last year, the City of Flagstaff won the competition. 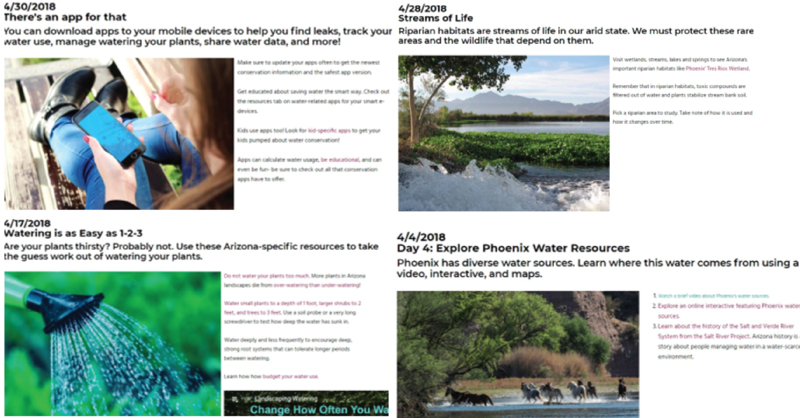 On social media, the City of Phoenix posted daily Water Awareness Month tips that ranged from exploring Arizona’s water resources to how properly water your household plants. 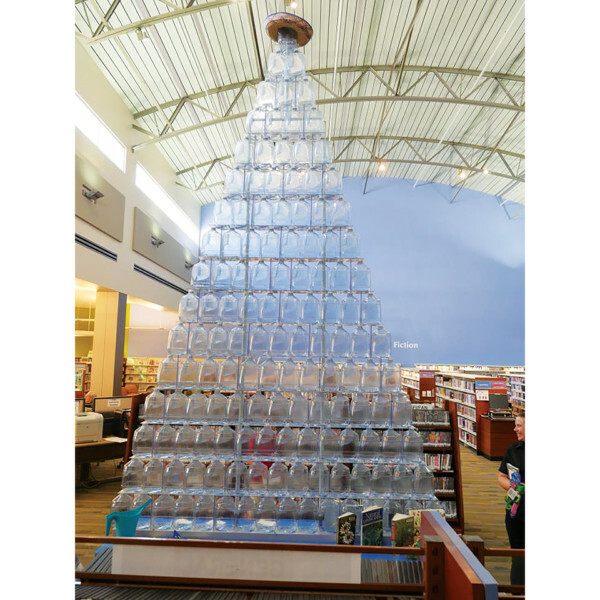 The town of Queen Creek immersed itself in Water Awareness Month, by not only hosting the Water-Use It Wisely water tower, but by providing residents with information on how to conserve our precious resource. The City of Glendale launched a new Water Efficiency Partner program where the city will conduct water conservation assessments for any commercial water customer free of charge. One of the largest water-conservation movements in the country, Water – Use It Wisely, kicked-off Water Awareness Month with a featured article “overflowing" with ideas and information on how to celebrate. 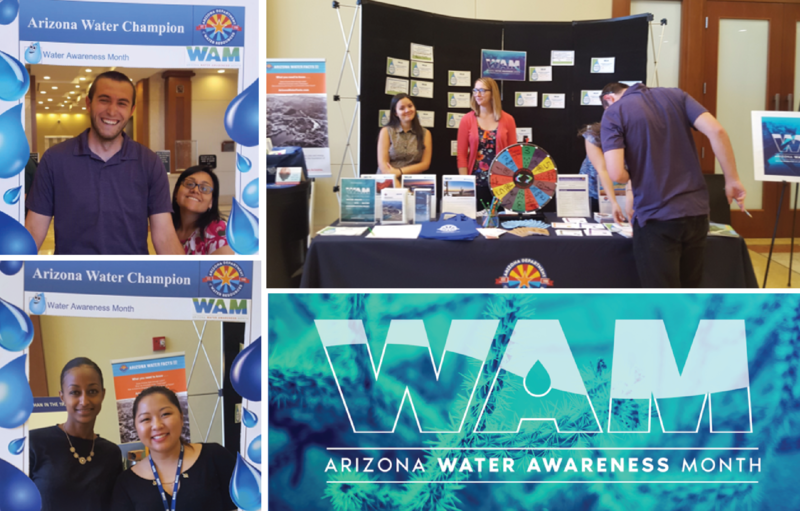 The Arizona Department of Water Resources had promotions in the lobby of the State enviromental building where state employees offered conservation advice, facts and tips on how to conserve. 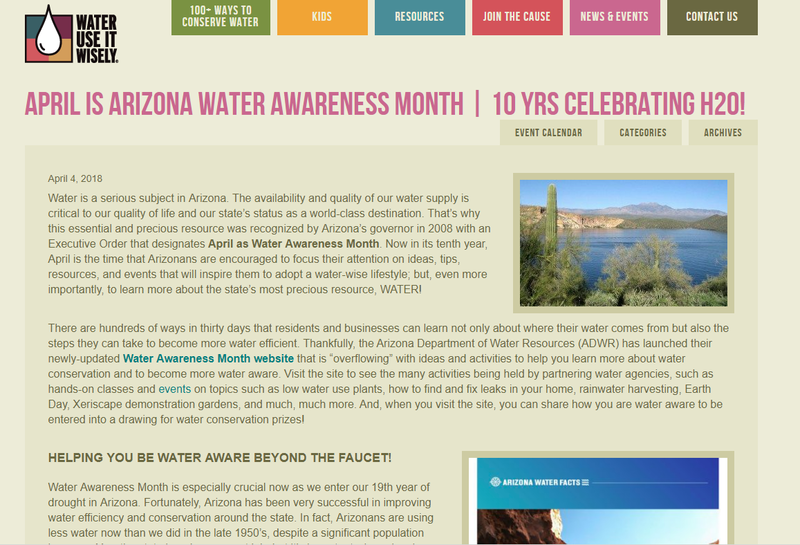 In addition, the Department recently updated ArizonaWaterFacts.com to include information about Water Awareness Month. Thank you again to all our Water Awareness Month partners for being a part of this annual celebration. 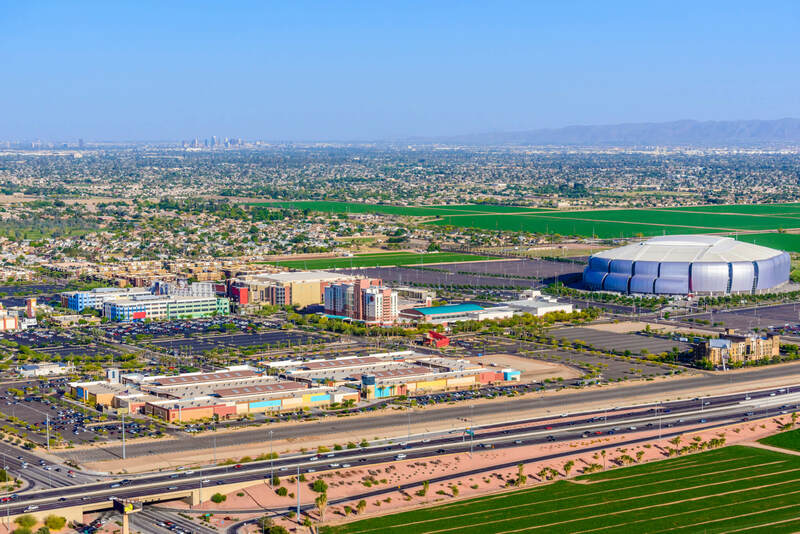 Your amazing events and valuable promotions will allow Arizona to continue to be one of the most “water-wise” states in the country. Therefore, we thank you again for your continued collaboration and it was a joy celebrating another great Water Awareness Month with you!